As a faithful reader, you know that I live in a sweltering swamp called Orlando. And sitting here at ehmmm…middle age, let me say that these two truths do not mix. My hair is long and I like it. I have had enough bad haircuts to know that I do NOT like my hair short! Since I like my long hair, during the summer, I wear it up, usually in a bun with a claw or a high ponytail. I get bored with these two styles so I googled blogs on hair styles. When I came across Hair Romance I noticed that her hair was similar to mine in length (at the beginning of this past summer), texture and color. 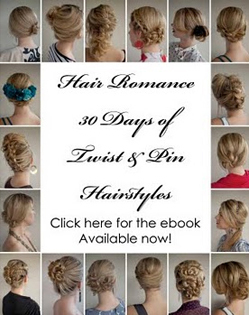 I think I was first in line when her e-book, ‘30 Days of Twist and Pin Hairstyles‘ went live. And I didn’t have one boring day of up-dos all summer long! Since I spoke with Christina about how her book made styling my hair so easy and fun, I asked her if I could share this wonderful book as a giveaway. 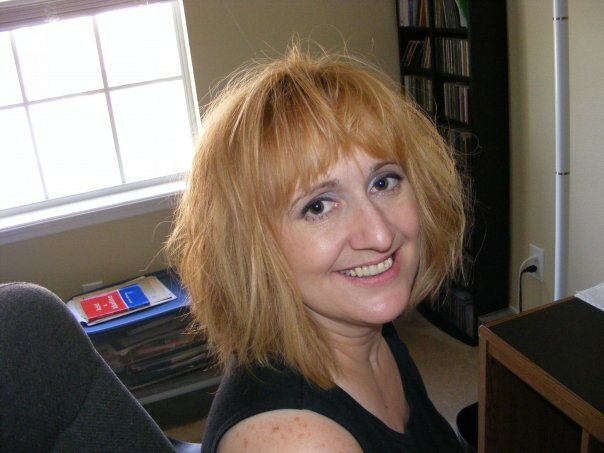 Christina is delighted to sponsor one winner her own e-book! This is a FLASH giveaway….quick and easy. Don’t hesitate to enter! *You must be a follower of Libby’s Pink Vanity to enter and list how you follow and with your name you use. *You must give me a valid email address to notify you if you win and where to send the pin number to access your e-book copy. *Since this is all electronic, it’s open to everybody!!!! *Giveaway starts right now and ends Sunday, 12/11/11 at 5 PM, EST. Get ready to learn some easy and quick up dos!! !